Everyone eats well in Belgium. As in Italy, it’s hard to get a bad meal, much less an inferior dish in any of the places I’ve visited in the country, whether in the Flemish-speaking north (Antwerp) or the French-speaking south (Brussels), or the quaint towns a short train ride away. I haven’t been in Belgium recently but did spend quite a bit of time there in past years, wrestling with stubborn clients (there are many local jokes about Belgian personalities). My best recollections, however, include beautiful cities, buildings and artwork, great seasonal shopping for well-made clothing, and of course, incredible food. Waterzooi is one of the classic dishes, native to Ghent, where, yes, you can still see the famous15th century Ghent Altarpiece, painted largely by Jan van Eyck, which now hangs in the cathedral. Its size and complexity are quite extraordinary. The town’s signature food, though, is a subtle but surprisingly flavorful dish, made with either fish or chicken. Waterzooi (from the word zooien, to boil) strikes a balance between stew and soup, since the poaching liquid is plentiful, studded with aromatic vegetables, and finished with a simple emulsion of egg yolks and cream. I like it for entertaining since, other than the last minute addition of the egg and cream, it can be made entirely in advance and reheated. I recently prepared waterzooi of chicken for a long-distance Christmas lunch, carted it a few hundred miles and heated it gently before adding the finishing touches. Served in deep bowls with crusty bread, it’s a meal in itself. Success depends on highly flavorful stock. I typically poach a cut-up chicken in half pre-made chicken stock and half water, with onions, celery and carrots. I use about 6 cups of liquid for a whole roasting chicken. You could also use a stewing hen, if you can find one, but that needs to be cooked longer. After simmering the mixture for about 30-40 minutes, I remove the chicken to cool, remove the meat and shred it, and return the bones to the pot. I then simmer the mix for another 30-40 minutes, cool the liquid and chill it overnight so that I can easily remove the thick layer of fat that accumulates. The stock should be gelatinous. I typically remove the carrots and celery but leave the chopped onions, which by now are reduced to sauce. 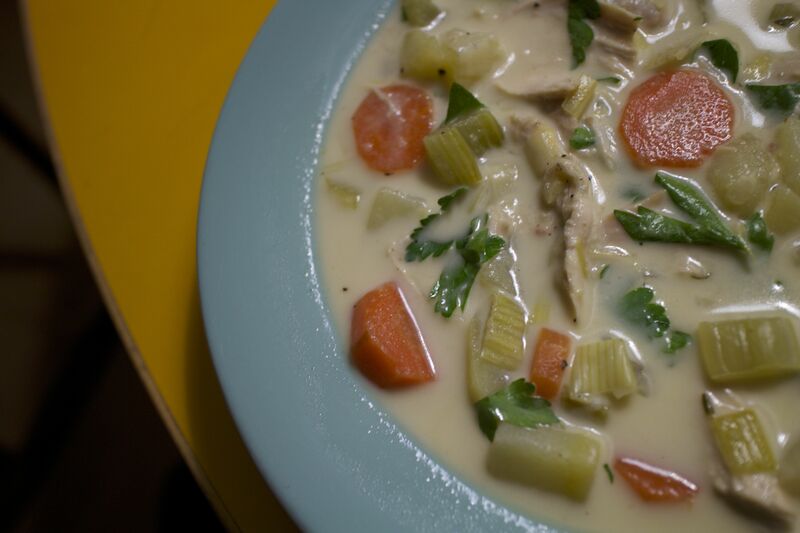 The aromatic vegetables in the finished dish include sliced leeks, carrots, celery or celeriac (or both) and cubed potatoes, which are poached in the stock before adding the chicken (you want to avoid over-cooking the chicken). You can make the waterzooi in advance to this point. Right before serving, lightly blend two egg yolks with ½ cup of heavy cream, ladle in some of the hot liquid to warm the mixture, and add it to the pot. Do not let the mixture come to a boil at this point or you will curdle the eggs. Season the mixture well with salt and pepper and chopped parsley, and you’ll have a delicious dish. Of course, you could make this all in one go, but I like to de-fat stock and also think that the flavors develop when made in stages. Cut the chicken into 8 pieces and season with salt and pepper. Melt the butter in a large pot over medium heat, add the onions and cook gently until they are translucent. Add the chicken pieces, skin side up, and add liquid to cover the chicken by about two-thirds. Add the bay leaves, parsley, carrot and celery, and bring the liquid to a simmer. Continue to simmer until the chicken is fully cooked, about 30-40 minutes. Turn off the heat and remove the chicken to a platter until it is cooled. Carefully remove the meat from the bones, shred it into 1½ x ½ inch pieces and refrigerate it. Return the bones to the pot, add salt, and bring the liquid to a simmer, cooking it slowly for another 30-40 minutes. Remove the bay leaves, parsley, carrot and celery and discard. Cool the stock and refrigerate it for several hours or overnight. Remove the congealed fat that floats to the top. Bring the stock to a simmer and add the carrots, celery, leeks, potatoes and celeriac, if using. Cook until the vegetables are tender but not falling apart, about 20 minutes. Add the chicken and heat the mixture until very hot (but not boiling). Lower the heat. In a small bowl, combine the egg yolks and cream with a fork. Gradually ladle in about ½ c of poaching liquid, stirring. Add a little more hot liquid so that the cream mixture is warm. Gradually add it to the pot, stirring. Heat gently, if at all, to avoid curdling the eggs. Add the parsley and season well with salt and pepper. Serve in deep bowls.